It’s an amazing feeling to be way up there, on the roof of a massive cathedral, looking down at the hive of activity below. We don’t normally think much about those church bells we hear, so this tour provides an inside look at all the clanging. You don’t have to book ahead. Just show up at one of the designated times, posted at a small desk to the right of the huge alter as you enter. After climbing lots of stairs, you get to go into both towers, plus walk across the roof from one to the other, lingering to take photos. This being Mexico, there are no ropes holding you back and no release forms to sign. If you too close to the edge and go plummeting to your death, it’s your own damn fault. Wow, that sounds awesome! Definitely something I would’ve done! 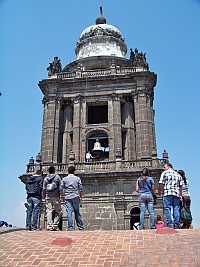 Never been to Mexico City, but when I do go I’m a definitely going to be up there ringing that bell! I can imagine how great that must be being up there while everyone is watchin you. Almost like the hunchback of notre dame!